The 2019 Toyota Corolla is finally here and is packing some seriously impressive features and capabilities. In this review, we at Andy Mohr Toyota will give you an overview of what this model has to offer when it comes to performance, interior features and space, and advanced safety. Shoppers in Avon, Indianapolis, and Plainfield should read ahead to get started! Leading the way in the 2019 Toyota Corolla is a 1.8-L 4-cylinder DOHC engine. This engine, which is equipped with either standard Dual Variable Valve Timing with intelligence (VVT-i) or available Valvematic technology, boasts an impressive fuel economy. Boost your efficiency even more in this model by replacing the standard 6-speed manual transmission with the available Continuously Variable Transmission with intelligence and Shift Mode (CVTi-S). This transmission creates its own gear ratios to ensure that you get the perfect amount of both power and efficiency for your driving conditions. Go one step further even with the Corolla’s available ECO Mode button. When the Corolla LE Eco is equipped with this feature, you’ll achieve an impressive EPA-estimated 40 highway MPG2. 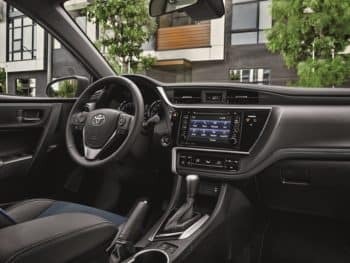 Inside the 2019 Toyota Corolla, you’ll have a variety of handy convenience and entertainment features to take advantage of. This model is standardly equipped with a 6.1-inch touchscreen Entune™ Audio system that offers standard advanced voice recognition, hands-free phone calling capabilities, and Bluetooth® connectability. Unleash the full potential of this system by upgrading to the Entune™ Premium Audio system with Integrated Navigation and Entune® App Suite. This system boasts a bigger 7-inch touchscreen as well as turn-by-turn navigation. You’ll also have Predictive Traffic and Doppler Weather overlay so that you’re in the loop after every facet of your journey. These features work like a co-pilot to help you prevent collisions and accidents before they happen. Using advanced exterior sensors and cameras, they can predict collisions that you may not even see coming. Then, they’ll give you a warning or even adjust automatically to help you prevent harm. Read more about the Corolla safety features now! 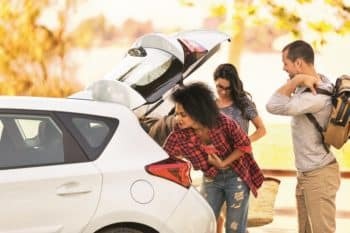 As you can see, there’s a lot to love about the 2019 Toyota Corolla. But this impressive sedan doesn’t stop here. Come get the full experience of the Corolla by getting behind the wheel for a test drive. Shoppers in Avon, Indianapolis, and Plainfield can schedule theirs today by giving us a call at Andy Mohr Toyota! 2 2017 EPA-estimated 30 city/40 highway/34 combined mpg for Corolla LE Eco. Actual mileage will vary.